Iceland is a nature photographer’s paradise, and there is a plethora of fantastic subjects to shoot practically everywhere you look. Sometimes we felt there just weren’t enough hours in the day to shoot it all, and, with 20+ hours of sunlight, that’s really saying something! From lunar landscapes to rugged seaside cliffs, from grandiose glaciers to gushing geysers, Iceland has it all. And, if that weren’t enough, the country is teeming with waterfalls. Everywhere. They come in all shapes and sizes, and many that would warrant state park status in the US hardly get a mention in the guidebooks or a spot on the map. 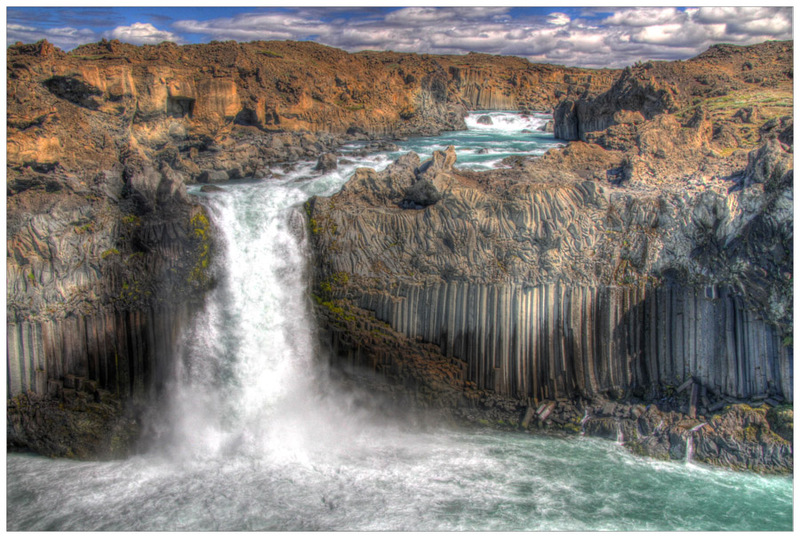 In fact, there are so many waterfalls in Iceland that many of them aren’t even named. We spent much of our time in Iceland trying to capture as many of its beautiful waterfalls as we could. Try as we might, our words really just don’t do them justice, so we hope you will indulge and watch this music video of our favorite photographs and video clips to get a sense of the incredible variety of chutes on offer. We promise it will “wet” your appetite. Enjoy! Great video! Fantastic views as always (and one of my favorite bands!). You’ve definitely sold me on visiting Iceland someday. We hope you make it there. It truly is spectacular, and we would happily go back for another whole summer. I think it is right up your alley. Thanks for watching the video. It is one of our favorites! Wow. That video has so many spectacular views. I think I might be almost paralyzed trying to figure out how to deal with them. Careful now! We wouldn’t want one of our videos to cause physical harm. We were aiming more for inspiration. We are glad that you enjoyed the views! Wow! What incredible photos of a unique place. I love waterfalls. I have been to Niagara Falls, and it was really neat to see in person. I also have been to Alaska and the waterfalls look beautiful like the ones you saw in Iceland. I hope to get there someday and see the exciting landscape for myself. Thanks for sharing! You are welcome, Andy. Iceland is a great destination if you like waterfalls. You are such a traveler–I bet you will get there someday! SO AMAZING!!! And I’m sooo jealous 🙂 Great work! Just finished watching this–SPECTACULAR!!! I’ve said it before and I’ll say it over and over–you guys should go pro! Thanks so much! We’re definitely not professionals, but we have a lot of fun trying!